Mahahual has several fishing tournaments that occur once the Marlin, Sailfish, Mahi Mahi and other big fish start their northward migration. 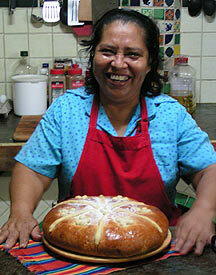 The Quintana Roo Governor's cup took place on May 2and 3 in Mahahual 2009 but sometimes is scheduled in late April. The You-Tube video below is in Spanish, but shows the quality of fishing that is available in Mahahual during that time frame. Mayan Beach Garden is not a fishing lodge, but rather a starting point to explore everything the area has to offer. Most people want to experience several different types of fishing and we can set that up for you. (per trip, equipment and drinks included) $250** 1/2 day, conditions permitting. Mayan Beach Garden cleans and prepares fish for you. Fly fishing through C&J Fishing. Fly fishing on the Costa Maya in the lagoons and Chetumal bay. 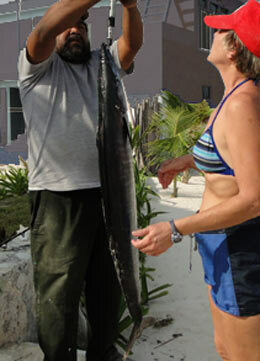 With enough notice, we can also arrange fishing in the Bahia de Espirito Santos in the Sian Ka'an. Fish for Tarpon, Snook, Bonefish, Jack, and others. Rates depend on location. 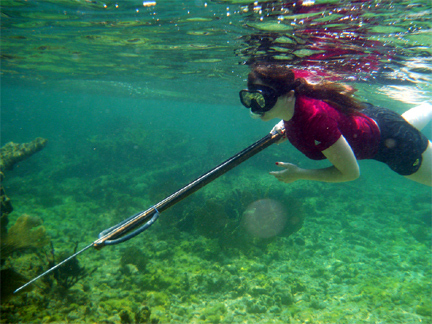 Spear fishing is for anyone who loves to snorkel and hunt. Put those together and you get Spear fishing. The sport is legal when you don't use tanks to hunt.